Connecticut's economically challenged Bridgeport Public Schools had long struggled with poor academic performance, including a low graduation rate. In addition, student enrollment began to decline after grade 8 as high school students moved to magnet or private schools. In an attempt to reverse the situation, the district tried a very different approach at its Central High School: an innovative high school model designed to engage students and teachers alike.
. For Central, the focus was on finding time for teacher professional development throughout the school year and on using teacher-directed lesson study as the main protocol for guiding teachers' professional learning. To accomplish these goals, Central worked with School by Design™ to implement a flexible design that gives teachers a full day of professional development every week at no extra cost to the district. After strengthening instruction in grades 9 and 10, Central has expanded the redesign to grade 11. Teachers collaborate in a double prep period, and a flex model was created for English and U.S. history. A college delivery model has been implemented with teachers leading the design of a simulated college experience in grade 12 to prepare students for post-secondary success. Central continues to move toward its goal of ensuring all students are ready for college and career, and that teachers have the time and support they need to accomplish this goal. Three years after Central adopted a more flexible, student-centered approach, the school reports several signs of improvement, including an increase in attendance and a reduction in referrals and suspensions. In addition, more students are successfully completing core classes and, as a result, more students are on track to graduate, and do so on time. The district's teacher contract requires high school teachers to teach 5 of 7 periods, to perform a duty for one period (i.e. cafeteria or hall supervision), and to plan for one period. The grades 9-10 school model shifted the duty period to a professional development period and created a four-day teaching week with a full day of professional development weekly. Daily prep periods remained the same. Because weekly time was the same, the shift fell within the contract and therefore only required a memorandum of understanding with the teachers union. Over time, Central moved beyond the initial strategy and shifted all teacher duty periods to professional development as their duty assignment. 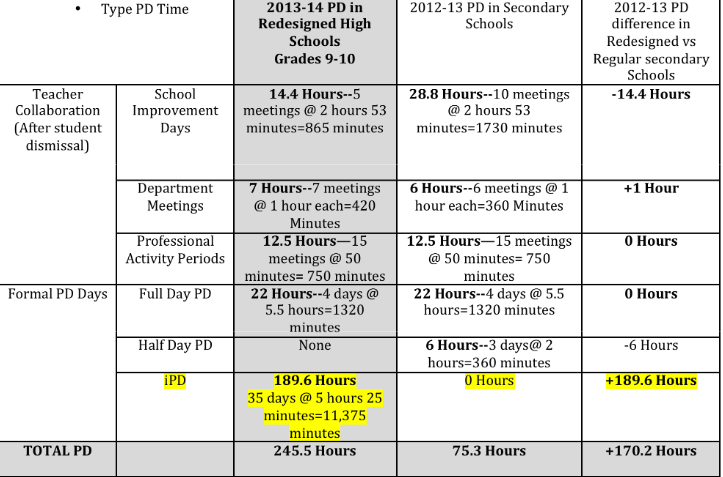 Teachers who remain on the 5-of-7 schedule have one professional development period daily. State policy requires all schools to meet requirements for instructional hours and teacher certification. Central met these and related policy requirements through blended learning, online learning options, and the flexible periods in the model. Also, an instructional/seat-time requirement was met by capturing time from passing periods and other schedule efficiencies. Optimize conditions that support teaching and learning. Maximize sustainability by using existing allocations, with no additional funding needed. Create a strong culture of care for students, combining high expectations for learning with support and engagement to ensure success. Focus on instruction, using InnovativeProfessionalDevelopment (iPD) lesson study, Literacy Design Collaborative (LDC), Math Design Collaborative (MDC), National Paideia Center Socratic seminars, and other supports. Create a PLUS team offering engaging electives that meet once a week while teachers are in iPD. Create a professional community based on iPD with teachers, staff, and administrators working together as professionals to ensure student success. Create a culture of continuous improvement, using TimeWise Schools annual strategic planning and design cycle to support informed decision making. Classroom conditions must be better for teaching and learning. The school redesign must lead to improved conditions in the classroom. What students are doing in PLUS time must serve them well. The work students do while teachers are collaborating needs to be instructionally strong, supportive, and engaging. Early dismissal from school is not an option. Professional development must be relevant and real. The content of teacher learning must be driven by classroom realities and teacher needs. "Bridgeport Public Schools: A Cross-Content Design" explains the different components of this iPD implementation. At Central, teachers use a district scope and sequence based on the Common Core State Standards (CCSS) to design instruction. Bridgeport Public Schools (BPS) uses Atlas (a web-based curriculum management tool) to provide teachers with access to a platform with rigorous cohesive curriculum authored by teachers and tied to the district CCSS scope and sequence. Safari Montage is used to support teaching and learning. Teachers in grades 9-10 focus on STEM and humanities core course delivery, with extra help for literacy and math built into the program (more below). In grades 11 and 12, work has begun on pathway models intended to engage students in thinking about career paths after high school. Pathway instruction will ultimately span grades 9 through 12. Blended and online learning is an ever-greater part of instruction at Central High School, part of a shift to a more personalized approach. The district infrastructure includes Wi-Fi access. In addition, students have access to Chromebooks and use a variety of online programs and teacher-designed lessons using 21st-century digital tools. Bridgeport Public Schools uses AimsWeb and Smarter Balanced Assessments (implemented in 2015). To meet the needs of the diverse student population, Central offers a selective alternative school that runs an abbreviated credit recovery schedule with three teachers. An accelerated college-preparatory program that includes Advanced Placement-level courses in marine and environmental sciences. Participating students attend a half-day program off-site at Aquaculture but participate in their core classes (English, math, etc.) at Central. For grades 9 and 10 at the neighborhood school, Central created four interdisciplinary humanities and STEM teams that teach four days a week, with one four-teacher PLUS Team of teachers that takes over one day a week for each of the four teams. The arrangement allows students to take an elective course while teachers prep. All teachers on the interdisciplinary and PLUS teams have daily prep, teach four days, and have one full day of professional development per week. The schedule is a variation of a 5-of-7 schedule and is based on a cost-neutral, class size-neutral TimeWise Schools design. Teachers team to teach students in long runs of time (three periods each). The team structure and flex schedule combination allows teachers to adjust time, grouping, and class size as needed. Students in the 9-10 model are grouped in cohorts of mixed ability. English learners (EL) and SPED students are mixed as well. In 2015-16, Central, along with other high schools in the district, launched a new pilot college-delivery design for students in grades 11-12, with teachers taking a lead role in giving seniors a college-like experience that includes coaching and supports to prepare them for post-secondary success. College-model students are mixed, with all magnet students in the program and a significant number of neighborhood students participating. By 2016-17, all students who have been in the school all four years will have experienced the restructured school, starting with the 9-10 interdisciplinary intervention. Bridgeport Public Schools is an inclusive practices district. Students with IEPs are served primarily in mainstream classrooms with push-in support. Depending on IEP goals and placement hours, additional support is provided in learning centers. BPS serves EL students both in bilingual classes and with support in mainstream classrooms. A model improvement year over year is pairing EL staff with the content teams to ensure language support for students. This is an ongoing improvement process with a newly hired EL director assisting. Central High School uses a seven-period schedule as its base. Normally, teachers teach 5 of the 7 periods, with one daily prep period, and one daily non-student-contact duty period. Under the redesign, core teachers in grades 9 and 10 use an adapted flex schedule to teach a four-day week, with one full day of professional development time built into their weekly schedule. In 2015-16, Central, along with other high schools in the district, launched a college-delivery design for students in grades 11-12, with teachers taking a lead role in giving seniors a college-like experience that includes coaching and supports to prepare them for post-secondary success. Magnet and neighborhood students are mixed in the college model. All 200 junior and senior magnet students participate in the program and approximately 150 of neighborhood students participate. Remaining 11th- and 12th-grade students take courses as before. By 2016-17, all students who have been in the school all four years will have experienced the restructured school, starting with the 9-10 interdisciplinary intervention. Courses include honors level, Advanced Placement, and ECE (UConn) — For AP, there is English, psychology, civics, calculus, biology, US history, chemistry; For ECE (UConn), History I, English 101 (Composition). Schedule design allows all teachers to see all students on Wednesday, but the teachers have built this as office hours and writing center time. Students who participate in the Aquaculture program or other elective and pathway courses at Central can do so in the model. Teachers have a double planning period by team. Central is one of the initial Innovative Professional Development (iPD) districts funded by the Bill & Melinda Gates Foundation. Central's innovation was to provide a weekly, full-day professional development for grades 9-10 interdisciplinary instruction, using the TimeWise flex schedule and PLUS teacher teams. Teachers at Central use the iPD lesson study cycle to design and implement high-quality instruction, working as a professional community to continuously improve their craft. Participating teachers create literacy-based assignments and use Literacy Design Collaborative (LDC) tools, including LDC modules and mini-tasks. Teams have the option to create interdisciplinary units. Teachers use the lesson study process to review student outcomes on lessons and assessments, and to inform instruction. Central has adopted the work of the National Paideia Center and has implemented Socratic seminars and critical thinking to deepen student understanding of text. Teachers in the traditional 5-of-7 schedule have one period of daily professional development time in addition to their prep period. Teachers in grades 11 and 12 plan and collaborate for 2 periods by department as the school has covered the duty periods with other non-load-bearing staff. In addition, all teachers have three pre-service professional development days, and all schools in the district have monthly early-release days and two additional full days for teacher professional development annually. There is a schoolwide expectation of rigorous academic participation, with an increasing culture of support and care. Before the redesign, the magnet school and the neighborhood school represented separate entities in Central's schoolhouse, but now the lines are blurring. The student-responsive model prepares more students to advance successfully to the demands of rigorous courses designed to help prepare for college and career. The school design also allows leaders to support teachers and staff in responding to students needs. The changes that began in grades 9 and 10, such as flexible learning blocks and weekly full-release day for the teacher teams, helped shift the professional culture at Central. Now there is greater teacher collaboration across all grades at both the magnet and neighborhood schools. As a result, teachers and leaders report there is more fluidity between the practices and the programs, and more students are going on to college-prep and honors courses. A key part of the school strategy is engaging families in activities like Family Night (previously Back-to-School night) and College Awareness Night. Central has increased opportunities for families to learn about the programs available to students, including the college model. Families now can access information about post-secondary opportunities and how to support their students by logging into Power School (where students’ grades and homework completion are reported by teachers) and Naviance (a program that houses each student’s four-year Success Plan). Weekly family education courses are offered Friday mornings by the counselors in Central’s media center.